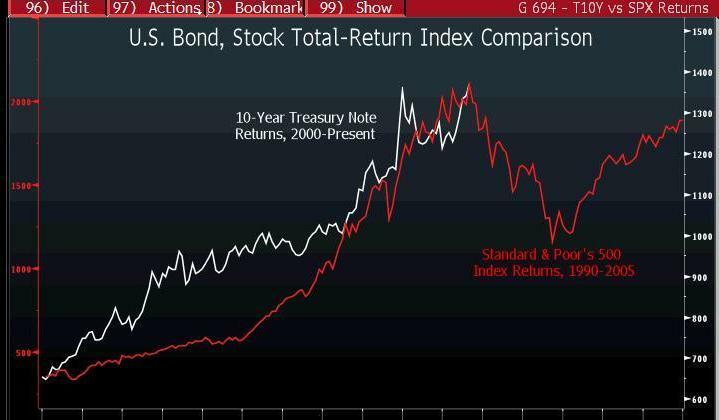 Do US Bonds Resemble Dot Com Stocks? 3) If you were honest, you admitted you had precisely zero idea when the day of reckoning would be. I mentioned this at the Agora conference last month, and again on Fast Money last night and Bloomberg radio this morning. What made the dot com situation so pernicious was that anyone who was judged on relative performance (i.e., Mutual fund managers), were all but forced into these names in order to keep up. Very few people — Buffett and Grantham come to mind — manged to both avoid both chasing these names and losing their client base. “U.S. bonds may be just as vulnerable to a plunge as stocks were a decade ago, when the Internet bubble burst, according to Tobias Levkovich, Citigroup Inc.’s chief U.S. equity strategist. The CHART OF THE DAY depicts how an index of monthly returns on 10-year Treasury notes since 2000, as compiled by Ryan Labs, compares with a total-return version of the Standard & Poor’s 500 Index from 1990 through 2005. The latter gauge peaked in August 2000 and tumbled 38 percent in the next two years.